Council Member Peter Koo, Representative Grace Meng, Deputy Inspector Thomas Conforti, Assembly Member Mike Simanowitz, and Assembly Member Ron Kim. Motorists have killed at least three people walking in the 109th Precinct since these officials held a press event last November to blame victims of traffic violence. An ambulette driver was charged under the Right of Way Law for striking and killing a pedestrian in Flushing. The crash happened Tuesday at around 8:57 a.m. The victim — a 57-year-old man whose name has not been released by police, pending family notification — was crossing 35th Avenue in the crosswalk when Ramon Ortiz, 55, struck him with an SUV while turning left onto the avenue from Prince Street, according to NYPD and reports from the Daily News and QNS.com. The victim died at New York Presbyterian Hospital. Ortiz was arrested and charged with violating the victim’s right of way, a police spokesperson told Streetsblog. 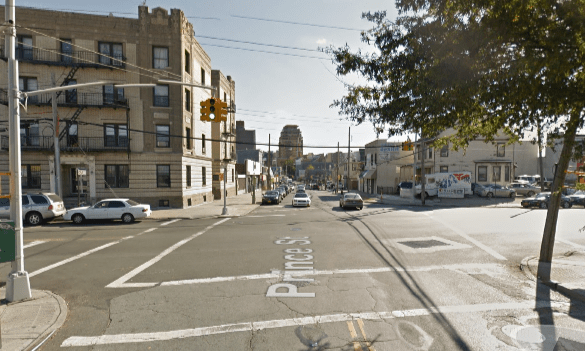 The victim was at least the third pedestrian killed by a motorist in the 109th Precinct this year, according to crash data compiled by Streetsblog. In at least one other case the victim was struck by a driver making a turn. The precinct is where a driver who failed to yield killed 3-year-old Allison Liao in 2013. Officers in the 109th Precinct ticketed 867 drivers for failing to yield and 738 drivers for speeding in 2015, according to NYPD summons data. In response to a series of pedestrian fatalities last year, the precinct and local electeds made a show of blaming people for their own deaths. If you’d like to voice your concerns about neighborhood traffic safety directly to Deputy Inspector Thomas Conforti, the commanding officer of the 109th Precinct, go to the next precinct community council meeting. Council meetings happen at 7:30 p.m. on the second Wednesday of the month at the precinct, 37-05 Union Street in Flushing. Call 718-321-2268 for more information. This fatal crash occurred in the City Council district represented by Peter Koo, who was among the officials lecturing locals on how to walk. As of this afternoon this case did not appear in an online database of court records, which publishes information on charges, court dates, and case outcomes. We’ll keep you posted. Has anyone in the press/media asked “Cross at the green, not in-between” Assemblymember Simanowitz ( http://www.streetsblog.org/2015/11/10/nypd-precinct-where-driver-killed-ally-liao-announces-walking-crackdown/ ) to comment on the deadly crash reported here? Is this a first? They actually arrested and charged someone? Congratulations are in order to whichever cop decided to actually enforce the law. We know that in most of the NYPD, they don’t arrest motorists who run over people on the *sidewalk* and inside *buildings*, so this is exceptional good news. Attention Albany: NYC’s First Traffic Death of 2018 Was a Brutal Hit-and-Run. Do Something. Jun Sum Yim, 77, was hit in the 109th Precinct, in Flushing. State lawmakers have repeatedly failed to fix laws that give drivers an incentive to flee after a serious crash.